First off, it’s worth saying congratulations to all at Big Finish for reaching 200 releases on the Main Range of Doctor Who audio adventures alone. 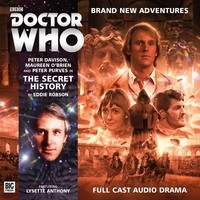 The Main Range is the core of the continuing adventures of the “classic” Doctors, as well as the main focus of the Folly. It’s not the only range we dip into, of course – the Lost Stories, Companion Chronicles, Eighth Doctor Adventures (eventually…) and more recently the themed boxsets (the Fifth Doctor Box, for example) have all wormed their way into this chronology – but seriously: two hundred adventures. There is quite literally something for everyone, whether you want totalitarian pepperpots, dark manipulative shenanigans, light-hearted romps, or journeys through canon and time.